“If you make money, there is a degree of moral responsibility to society to do what you can to help society in a reasonable way “(John Todd, Todd Corporation Chairman, Dominion Post, 27/ 07/11). • When should adults who care for vulnerable children be prioritised for services over others? • How can the Government encourage communities to take more responsibility for the wellbeing of their children? • How much monitoring of vulnerable children should the Government allow? The paper can be found online at: http://www.childrensactionplan.govt.nz/ or see www.facebook.com/greenpaperonchildren. The closing date for submissions is 28 February 2012. Supporters of the Green Paper include Murray Edridge (CEO Barnadoes), Norm Hewitt (sporting personality), and Sandra Alofivae (family and youth law), who will help with the direct public consultation. Finally, the Families Commission believes every child deserves the chance to thrive, belong and achieve, and enabling that is “the single most important debate this country can have.” They see the Green Paper as an “opportunity for all New Zealanders to work together to find a non-partisan solution” and have a wide range of relevant resources on their website. Others are not quite so sure about the paper. United Future Leader Peter Dunne welcomes it, but is concerned about mandatory reporting as this could lead to people being fearful of taking their child to the doctor or dropping them off at school. The Greens share his concern. The New Zealand Herald reports some sad statistics: CYF confirmed 21,000 cases of abuse and neglect in 2009/10; more than 30,000 students truant from schools on any given day; 13,315 avoidable hospital admissions in 2008/09 were for children under five; 47,374 children (aged 0-16) lived with a victim of family violence reported to police in 2010; and, at any one time, 15 per cent of children (or 163,000 under 18s) need support and intervention. Child mortality, mental illness, teenage pregnancy, obesity rates can all be reduced if we have a more equal society. 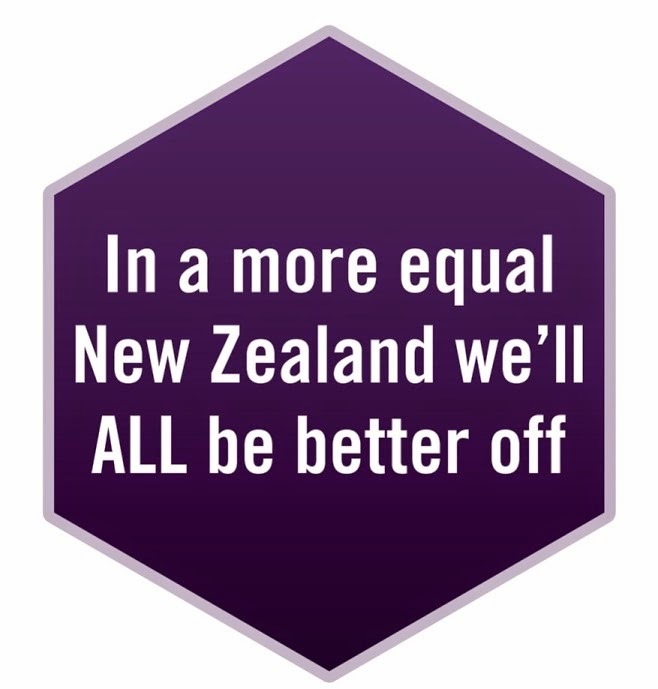 A simple way to help make this happen is to support NZCCSS work on reducing inequalities. All you do, is click here. Around 22% of households sometimes or often run out of food because of lack of money. The Child Poverty Action Group wants the government to fund breakfast programmes in Aotearoa New Zealand’s poorest schools. Their report called Hunger for learning: nutritional barriers to children’s education, looks at five Auckland schools that run breakfast programmes. An easy way to assist children’s learning is to provide breakfast for any child in a Decile 1 or 2 school who needs it. This could be done on a universal basis so as not to stigmatise any child. The programme would cost between $7 million and $14 million which is less than what the government spends on Gold Card transport subsidies. The Whangarei Child Poverty Action group support the move. They comment that real benefit levels remain below what they were prior to the 1991 benefit cuts, and it is not right children are suffering as a result. Northland has the highest unemployment level in the country. CPAG in Whangarei have started their own research on people’s reliance on other sources for food, e.g. foodbanks, school food. They want to know about any community organisations providing food. The Salvation Army does a quarterly shopping survey in South Auckland. June results show a typical sole-parent family experienced a 9.1 per cent jump in its cost of living in the 2010/11 year. Families with 2 parents and 3 children faced a 8.2 per cent increase. Their work is based on Statistics New Zealand Consumer Price Index but uses a smaller number of commodities and services, taking into account that low-income families have different spending patterns than middle-income households. (3) People struggling with early childhood education costs which have increased by 11.7% in the year to June. Government funding reductions targeted centres with more than 80% of their staff qualified. (4) Unemployed young people - People may have seen the New Zealand Institute’s More ladders, fewer snakes: Two proposals to reduce youth advantage report which illustrates around 45% of our unemployed are people aged 15-24. The cost from youth unemployment, youth incarceration, and youth on the sole parent benefit is around $900 million each year. (5) Cold Cantabrians keeping warm by staying in bed, putting blankets across the drafts, taping up the windows and pulling the curtains. Not surprisingly, Society of St Vincent de Paul chief executive Michael Gousmett says "There are a lot of people doing it pretty hard." The Law Commission wants feedback on New Zealand’s credit repossession laws – the rules about what happens when consumers default on a credit contract. The Commission wants to know whether there should be a ban on repossessing certain items, e.g. children’s belongings, medical necessities, eftpos cards etc. The Commission wants to hear from people who have “either suffered, or know of others who have suffered harassment and oppression.” They also want lenders to tell them how well the law works for them. Closing date for submissions is 19 August 2011. Find the paper here . Email address for submissions: creditrepo@lawcom.govt.nz. Do our elderly live on icebergs? It might suit Happy Feet, but living in very cold places can make our older people ill. United Future leader Peter Dunne has launched two policies to keep older New Zealanders warmer and healthier. The Winter Warmer provides for a top-up of $50 a month for superannuitants for the three coldest months of the year when their power bills reach $150. A free annual Warrant of Fitness enables health checks for over-65s to identify health problems and illness early. More details here. Effective addiction treatment is made more difficult by fragmented funding and accountability, according to the National Committee For Addiction Treatment more. What with earthquakes and snow, it is not surprising people in Canterbury are stressed. Tony Milne from the Problem Gambling Foundation thinks more stress may be resulting in more speeding on the pokies. Christchurch pokie revenue increased $3.8 million in the last financial quarter, taking the city’s national share of the pokie cake from 9.3% to 10.4% more. Social Development Minister Paula Bennett has released a progress report for this youth justice initiative. The programme is to to provide “better, longer-term interventions for serious young offenders on a clear path to adult prison and a life of crime." Over 1,150 young people have been involved in the programme which was initiated in October 2010 more. Click here for a summary of the report. Community Housing Aotearoa is keen for all organisations with any interest in community housing to directly register their interest on the Social Housing Unit website. They want people to tick the box that says ‘Send me news updates’ because it will demonstrate that people in the sector are aware of the changes, want to be on a mailing list and want to be involved. The unit’s terms of reference can be found here. Supplementary Innovation Fund round for Canterbury: “The Innovation Fund aims to encourage and stimulate communities to deliver their own promising solutions to local youth offending problems, with a particular focus on addressing the needs of Māori children and young people in the youth justice system.”A supplementary round of Innovation Fund funding for 2011/2012 is now available giving Canterbury based providers the opportunity to apply for some of the $570,000 that remains unallocated from the third round. The fund will be distributed through a system of grants, with a maximum of $50,000 for each grant application, for service delivery until 30 June 2012. Applications close on 11 August 2011. Support for families with newborns: Bellyful http://www.bellyful.org.nz/ is a group of mothers who volunteer their time to cook and deliver meals to families with new babies - with the particular focus on mothers who are lacking a social network or friends or family. They acknowledge the pressure placed on a family during the newborn phase (and in times of illness) and aim to provide cooked meals and to build friendships, thus strengthening the community as a whole. Bellyful is keen to spread the word about their work. Seminar: Who’s counting the costs? Welfare reform and health? Chief Executive The Churches Education Commission (CEC): won'ts effective leadership for staff and volunteers, and ability to build strong relationships with educators and church communities. They want a person with tertiary qualifications in education or management, proven leadership in education or an NGO, and excellent interpersonal and public speaking abilities. Contact Gordon Duncan on (09) 9159141 or apply on line at http://www.farrowjamieson.com/ quoting reference 8940. Chief Executive Howick Baptist Healthcare: must have experience in people leadership, working with a Board in the delivery of quality services and sustainable strategic growth. Management in the health sector would be an advantage. Contact Gordon Duncan on (09) 9159141 or apply on line at http://www.farrowjamieson.com/ quoting reference 8911. Development officer: The Bishop of Taranaki needs someone who understands and is passionate about working for the common good; who has a strategic and analytical mind; with imagination, creativity, vision, and a deep-rooted passion for the work of the Foundation and Cathedral more.